We ran a Costume Contest throughout the day at the Convention, we also ran a bonus competition for everyone that registered for the event at least two weeks before the day itself. We drew at random the name of one attendee and offered them the chance to bring a friend to a meal at Oakley Court Hotel, the location used for the filming of The Rocky Horror Picture Show. Our lucky winner was Caroline Dawkings and she brought her friend and fellow attendee Gemma Tebbutt along to the meal. Nik Rosser collected the girls in a rented limo and drove them to the hotel. We had neglected to tell anyone that we had brought a few Guests of our own. 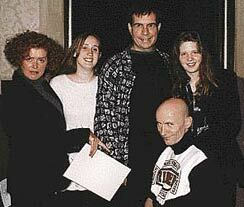 They were met in the lounge by Stephanie, myself, Sal Piro and Patricia Quinn. As they were getting over the surprise of meeting Sal and Patricia, Richard O'Brien walked into the room! We enjoyed a pleasant lunch and then Richard and Pat showed us all where individual scenes were filmed and explained what it had been like filming at the then derelict location. We stayed for several hours taking lots of pictures, which were later presented to the girls as a memento of their day. We wanted to make the prizes for the Costume Contest something very special as this was our first convention. We commissioned a set of 30cm high Griffins, based on the originals from the Picture Show, in the TimeWarp room (hence the bowler hats). The statues were made by Susan Moore, best known for her work making various 'monsters' for the BBC Doctor Who television series and completed only hours before the event itself. The original mould they were cast from was destroyed after the convention so if you didn't win one on the day, you'll need to find a winner willing to sell and have a lot of spare cash! None of our winners knew what the prizes would be before the presentation, as we managed to keep them a secret from everyone except the committee. The Costume Contests ran throughout the day. To make the judging as fair as possible we adopted the system of audience applause to select the winners in each category. The prizes were presented at the end of the day in the Hotel, before we all left for the cinema show, by Anthony Head one of our guests on the day. 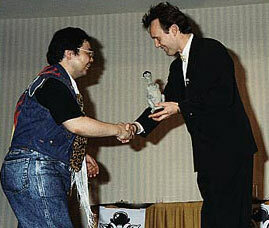 << Best Frank 'N' Furter 1992: Nik Sparkes being presented with his Griffin Statue by Anthony Head, the competition was not restricted to 'Film' or 'Stage Versions' but sought to find the best/most popular interpretation of each character. We received no entries for the Space Riff, Rocky or Dr.Scott categories, people dressed in these costumes at the Convention are still kicking themselves to this day.